Ghost shrimp are supposed to be white, but the ones we find are normally pinkish. They still live up to their name, though, by being super wily and rarely seen. And here's a better photo of a ghost shrimp. Since the 1960s oyster farmers on the coast (definitely not us!) 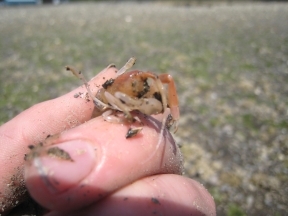 have applied the pesticide Carbaryl to their beaches to control ghost shrimp populations. But the pesticide also is toxic to juvenile salmon and Dungeness crab, among other aquatic species. This is obviously a bad thing for ecosystems. As one of our staff put it: if you pee in the corner of the pool, you still peed in the pool. (When you're farming in the water, you think of this kind of analogy.) Washington State and oyster growers in Willapa Bay are working together to develop alternative ways to control ghost shrimp, and, according to this Seattle Times article, the chemical is supposed to be phased out by 2012. Another interesting fact: according to the Monterey Bay Aquarium, in the 1980s fishermen harvesting ghost shrimp for bait took 5,953 pounds of the tiny shrimp annually out of the Los Angeles and San Francisco areas. So maybe the Willapa farmers need to develop a bait industry? Go here for more info about ghost shrimp.